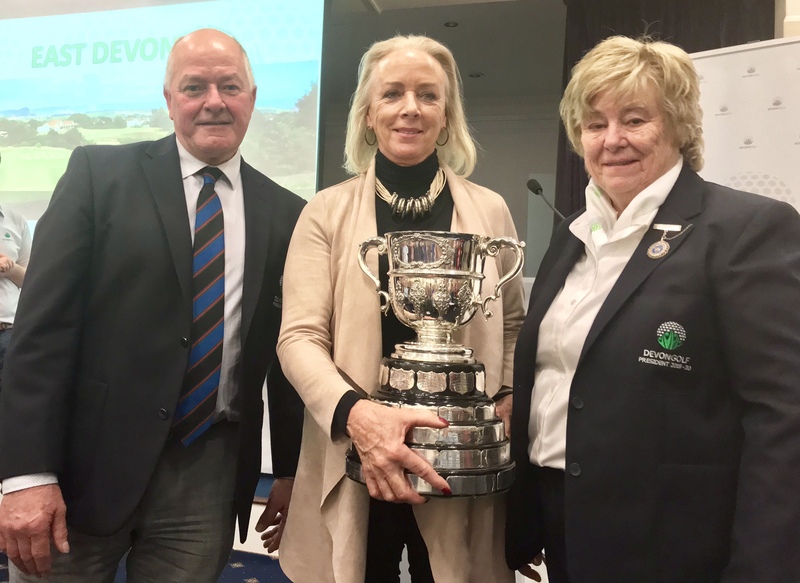 The meeting was held in the Duckworth Suite at Exeter Golf & Country Club and was called to bring Devon golfers up to date with how the first year of unification was going and to share the future plans. It was clear to see why Exeter G&CC have been nominated Most Welcoming Club of the Year at the England Golf Awards 2019 as the staff had everything in place and smiles on their faces. There was a definite buzz in the air as golfing friends greeted each other across the room, much coffee was imbibed and by 11am over 200 people had gathered. Nick James, DevonGolf Chair, opened the meeting and welcomed everyone. Wendy Stanbury, Director for Development, introduced the Directors and a few of the people who make DevonGolf tick. Wendy explained how her role covered Development working alongside Andy Jack, County Support Officer, communication - of which this meeting was a shining example - as well as marketing. The website was a prime communication case in point, as was the new logo designed by local golfer and graphic designer Hannah Stephens. Wendy emphasised the importance of the communication network she and Yvonne Alford have set up - DevonGolf sending information to Club Managers and Area Representatives. The Area Representatives work with Club Representatives to ensure all information gets through to everyone. Following Wendy, Team Leader Pip Lee gave a brief outline of Course Rating. Course rating is well underway and another 7 courses are already booked for this year. It takes about 45 man hours fo rate a course, it's time consuming and the clock is ticking. Lead Referee David Smith managed to make the rules and the new rule changes interesting, raising a laugh around the room as he displayed his forthcoming holiday reading - The Complete Official Guide to the Rules of Golf and Their Interpretations - a weighty tome! Director Liz Turner talked about the handicap changes, now and future. She stressed the importance of the responsibility of individual players to return as many cards as possible in a season, not to "No Return" but complete a card wherever possible. Supplementary cards should also be used and she explained how it was in our own best interests to give as broad a view of our continued play as possible. Safeguarding is a major topic in all sports and walks of life. Paul Cloke gave a brief talk of what clubs should be doing to protect their members and their club. DBS certification is a must for Junior Organisers and attending courses such as Time to Listen, which DevonGolf is providing for clubs at a subsidised rate. Clubs should ensure that those involved with juniors or vulnerable adults are suitably trained. 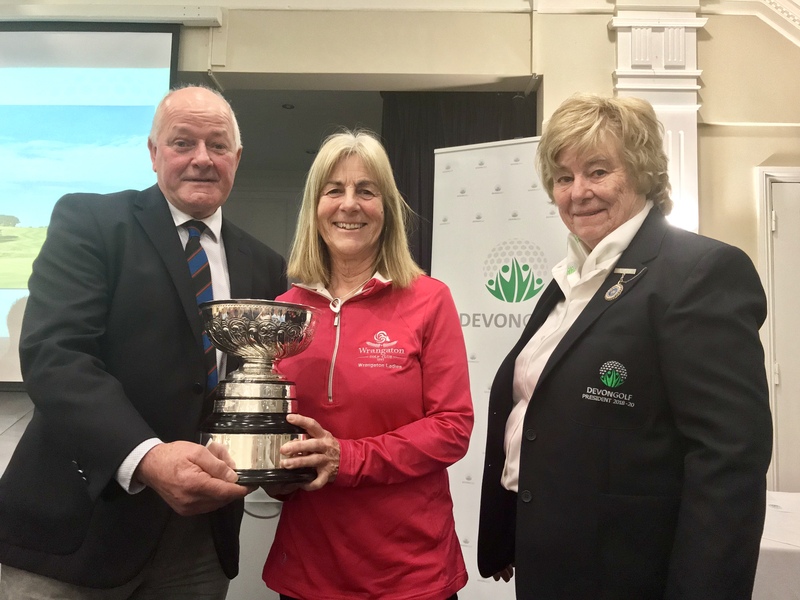 Kate Field, who is the DevonGolf Ladies' Competition Secretary, outlined the changes that are taking place as DevonGolf continues to review and streamline where possible to give the best possible experience to our golfers. The main trophy competitions continue across the board and a new 9 hole competition for high handicap golfers has been introduced. In July, at Bovey Tracey Golf Club, men with handicaps of 29 and above and ladies 37 and above can play in the County 9 Hole Stableford. Club Support Officer, Andy Jack, outlined how he is able to support clubs with their business planning, membership retention and Get Into Golf schemes. He used Great Torrington as a case in point. Great Torrington doesn't have a golf professional but they had ambition. They set up fund raisers and engaged Ross Daniel from Royal North Devon Golf Club to go into schools and teach groups back at the club. Over 50 juniors joined the club and, from that, 6 adults. An amazing success for a small club who put their heart and soul into bringing youngsters into the game. 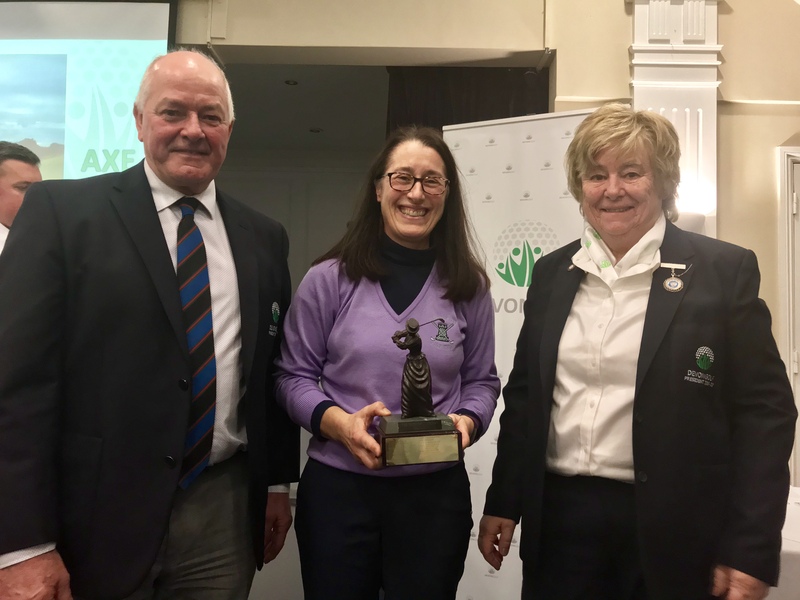 Joint Presidents Carolyn Maynard and Richard Pascoe presented the Parker Trophy, accepted by Colin Nolan on behalf of Yelverton and the President's Trophy to Okehampton's Team Captain Frances Harbron. 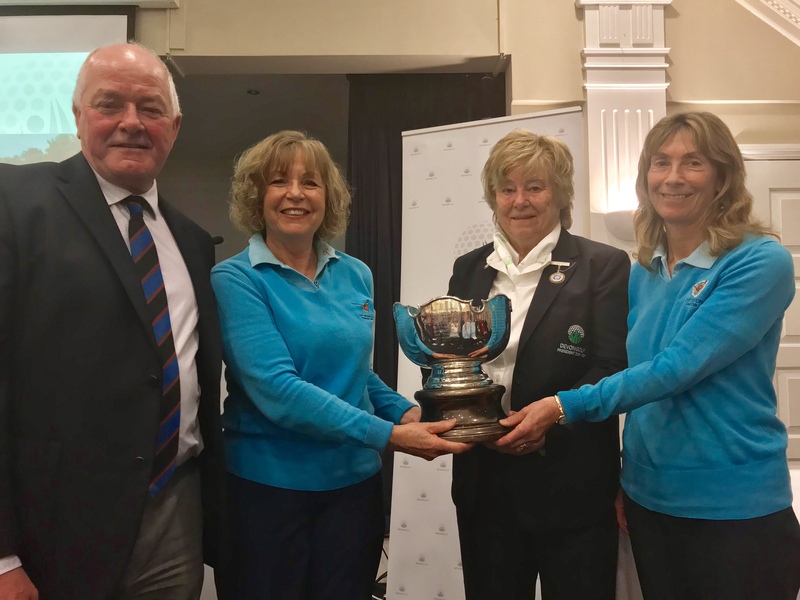 Deirdre Mackness & Joy Wisdom were the winners of the Doris Willes-Little Trophy and team member Wendy Roberts accepted the Sheelah Creasy Bowl on behalf of Wrangaton. 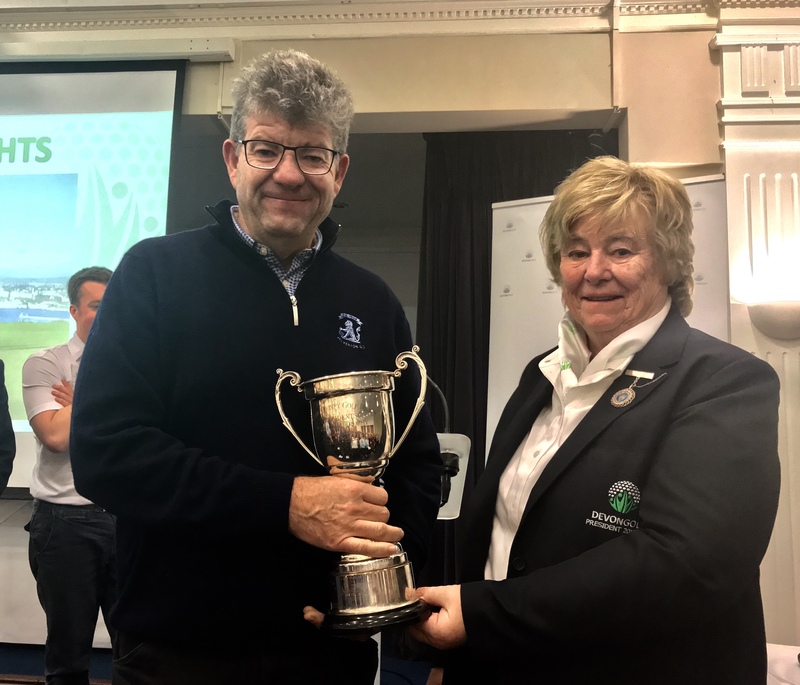 Lady Captain of Torquay, Marilyn Firkin, was presented with the Still Cup - won by Torquay for the third consecutive year (no, they don't get to keep the trophy forever!). The meeting finished with a Q&A chaired by Nick James who closed the meeting by thanking everyone for coming. DevonGolf thank all those who took the time to come, listen and share their views.